Yesterday’s Fall River Herald News featured a story on the new Friends group which has begun a program of planting trees at the historic Victorian cemetery. Oak Grove was begun in 1855 with a 47 acre parcel purchased from Dr. Nathan Durfee who sold it to the city for $200 per acre. 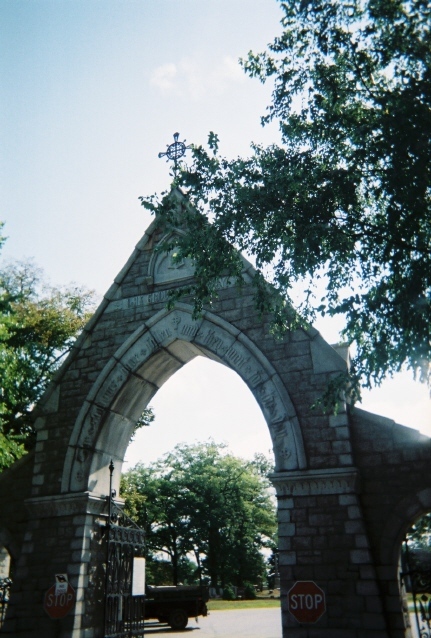 The entry arch was erected in 1873. The site http://oakgrovecemetery.wordpress.com features the Borden-Almy plot, Borden-related gravesites, and information on the Borden’s funeral. Over 500 “hits” have come in over the past 24 hours to the site, with a lion’s share of visitors reading about how to become a member- with the Borden-related information a close second. Lizzie still holds a fascination among the city’s population.